I know I said I’d show you guys how to do this so I finally am! Sorry about the wait, but I think you’ll find it was worth it! This is a BEAUTIFUL and easy DIY accessorie project that will “wow” everyone who sees you wear it. 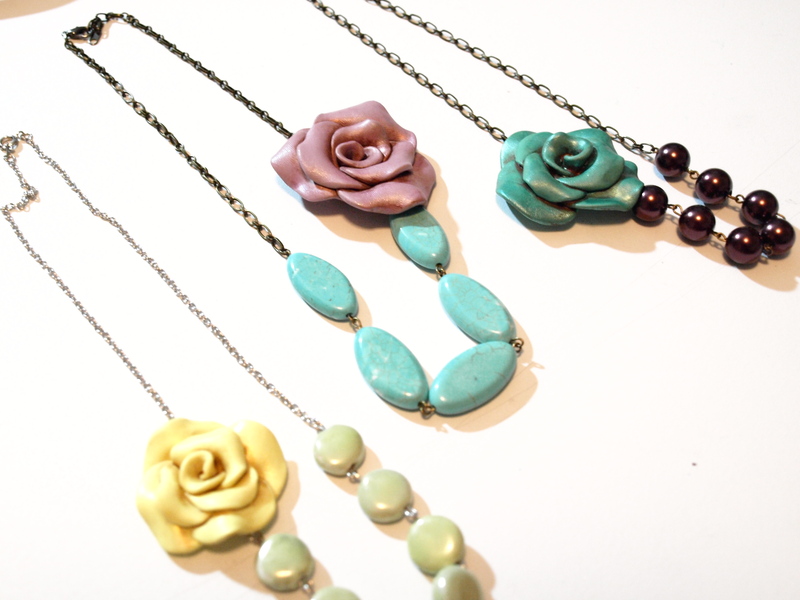 This necklace is especially befitting for the spring (I LOVE SPRING!!) and I figured since it is Easter this weekend it will be the perfect compliment to your Easter ensemble. The thing I like most about this project is that it is cheap (of course) and unique in that each rose turns out a bit different and you can customize the colors to any you’d like. So lets just jump into it then shall we! A set of jewelry making tools (round nose pliers, wire cutters, flat nosed pliers). I got mine at Walmart in a set of 3 for about $7. Sculpey Clay. Or other polymer clay of your choice. They have a huge variety of colors for about $2 per block. I usually stock up when they go on sale for half off. I typically get the primary colors plus black, white, and brown and then mix them myself to whatever I need. Acrylic craft paint. 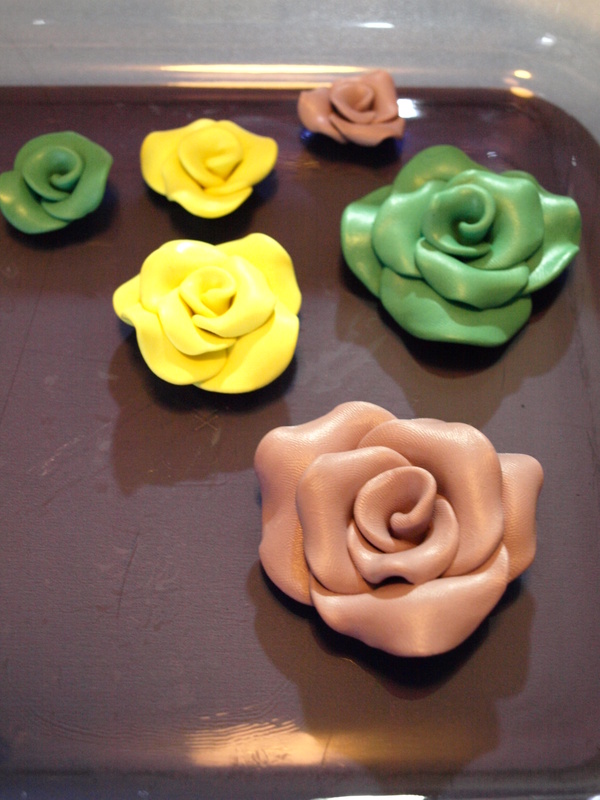 I like to use brown, and sometimes metallic gold and silver to get the vintage/antique look to my roses. A craft knife or utility knife. A bead reamer or a skewer. A palette. I use a plate covered in tin foil. 5-9 medium to large size beads in a coordinating color to your rose color pick. Jewelry chain, jump rings, clasps, and eye pins. If you’re serious about making jewelry its worth it to get familiar with the basic techniques to jewelry making. I am honestly not a pro at all but found that a lot can be done with my cheap supplies and tools and some basic techniques. Also, on a side note, I get a lot of my jewelry findings at The Dollar Store, Walmart, and my local craft store when they’re half off so its really not that expensive a hobby to have. And its nice to have some supplies on hand to whip up last minute gifts for friends and family that are classy and handmade and look way more expensive than they actually were to make. To help you out on this front, heres a link to a great site that will teach you the basics you’ll need to complete this project as well as help you with future jewelry making endeavors. 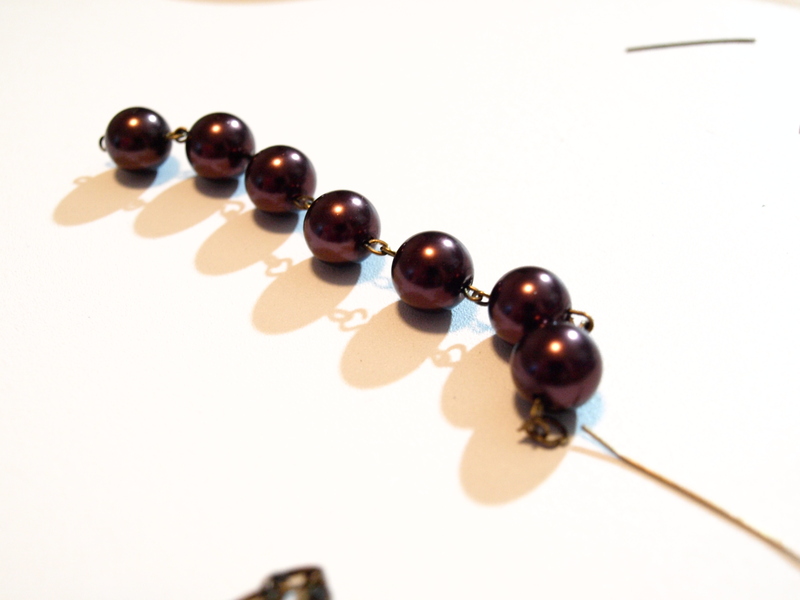 And if you need a little more to get you started, heres a couple more sites I found that I thought were clear and concise: http://www.jewelry-making- instructions.com/beaded-links.html ,http://www.making-jewelry-now.com/jewelry-making-instructions.html . There, seriously easy huh? With just those simple skills and your Walmart tools you can make literally hundreds of amazing pieces of jewelry. Now to the part I’m going to really teach today. 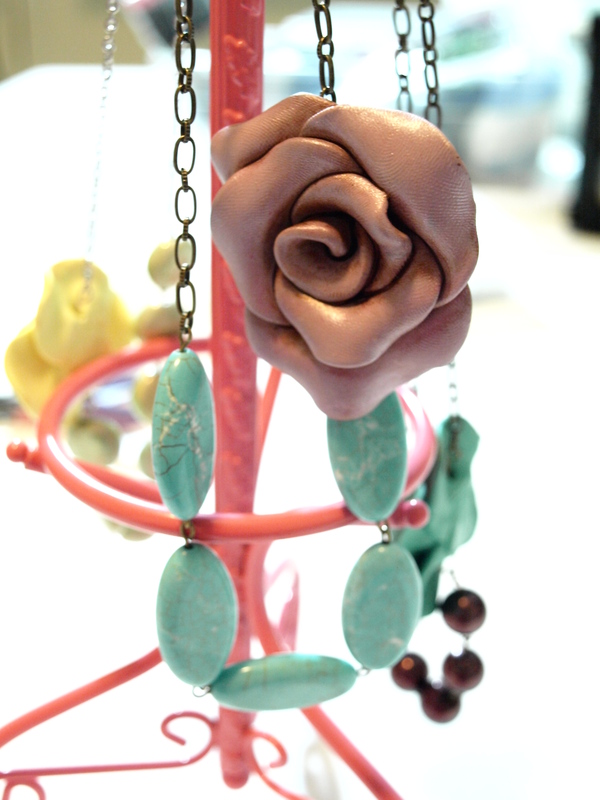 How to make the vintage inspired clay rose bead that is going to completely MAKE this necklace. Ready? Here we go. Decide what color(s) you’d like to make your rose. When I do this project I usually make a few different color options and do them at the same time just to make it worth the effort and to use as “give-aways” to my friends (cuz you know they’re going to want what you’ve got when they see your awesome necklace). If needed, mix your clay to get your desired color. If for some reason you missed kindergarten and first grade and never learned how to “mix” colors, refer to a color chart. 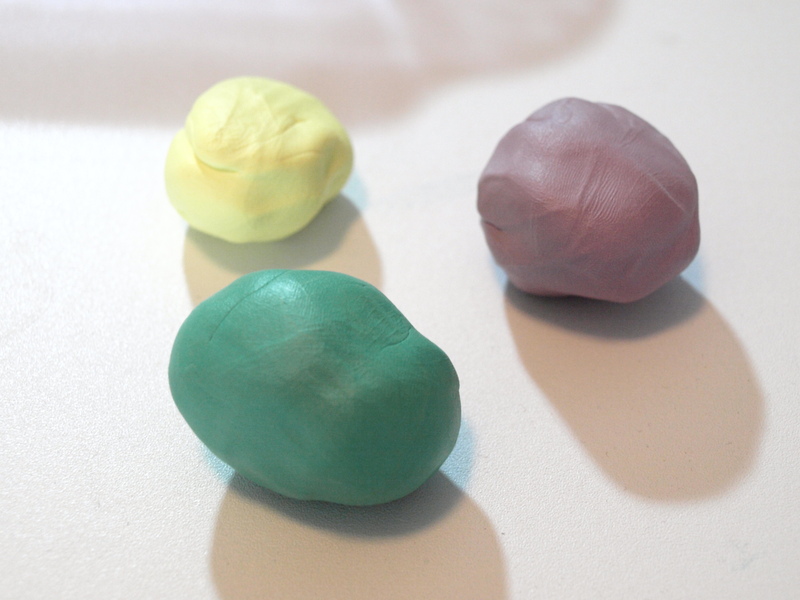 I mixed red, blue, and white to get my pastel purple colored clay, green, yellow, blue, and white to get my turquoise colored clay, and white and yellow to get my pastel yellow clay. Or you could just take the easy road and buy the exact color you’d like since they have plenty of color options at the craft stores to suit your needs. 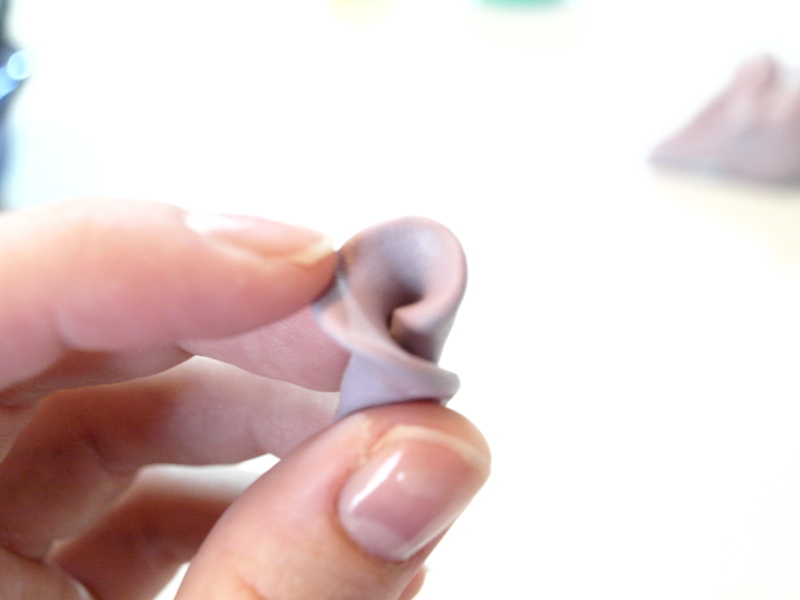 Although if you forgo the color mixing, you still might want to work and knead your clay to make it a little softer and more pliable to work with. Once you’re clay feels pliable enough and is the desired color, pull off a small section and roll it into a ball (about the size of a pea). 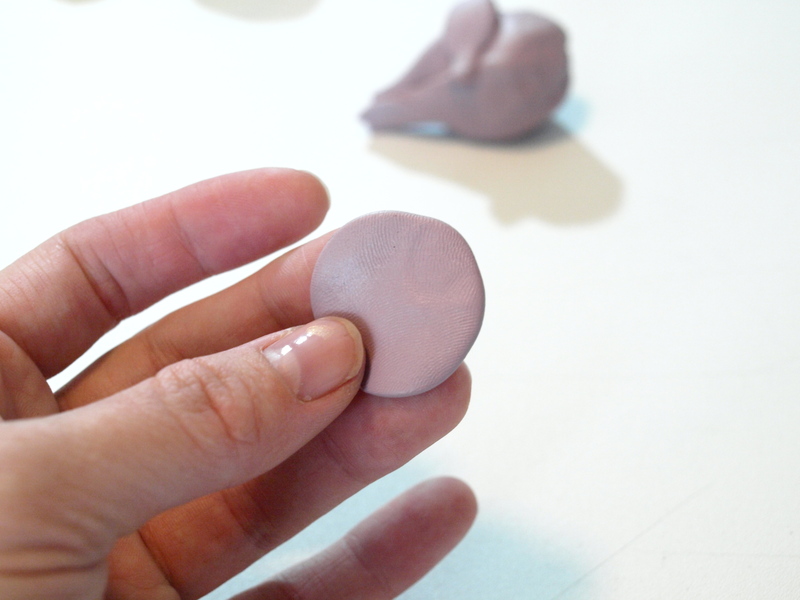 Then using your fingers, smoosh that ball of clay flat and smooth (but not too thin since you want your rose petals to be durable after baking) to form a small disk of clay. Don’t worry if its not perfect. If you don’t like your rose center, just reform it into a disk and start again. 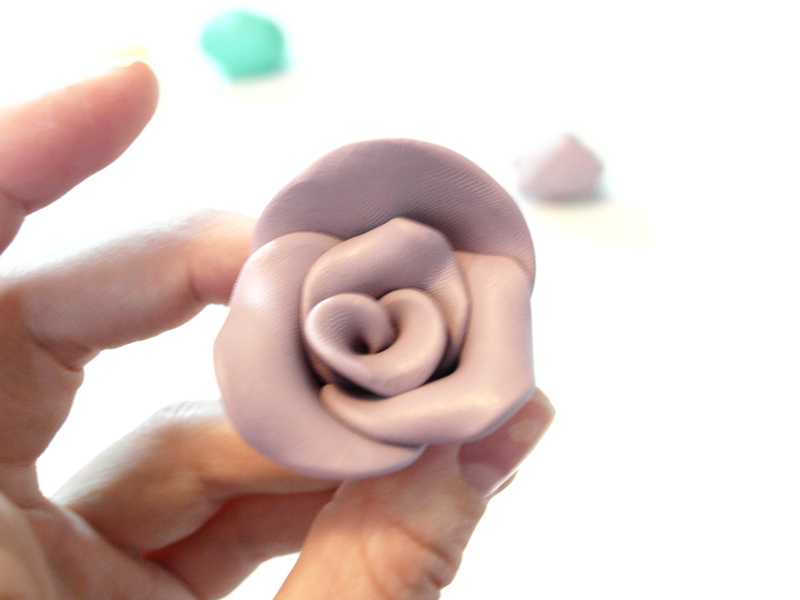 You’ll get the hang of it soon and then you can set your center aside and work on the outer petals by using the same idea; start with a portion of clay (a bit larger than pea sized now), roll it into a ball, and smoosh it into a disk. See how it is already starting to look like a rose? To make the petals more “real”, pinch, pull, and bend the edges of the petals up and/or down to get that life-like effect. 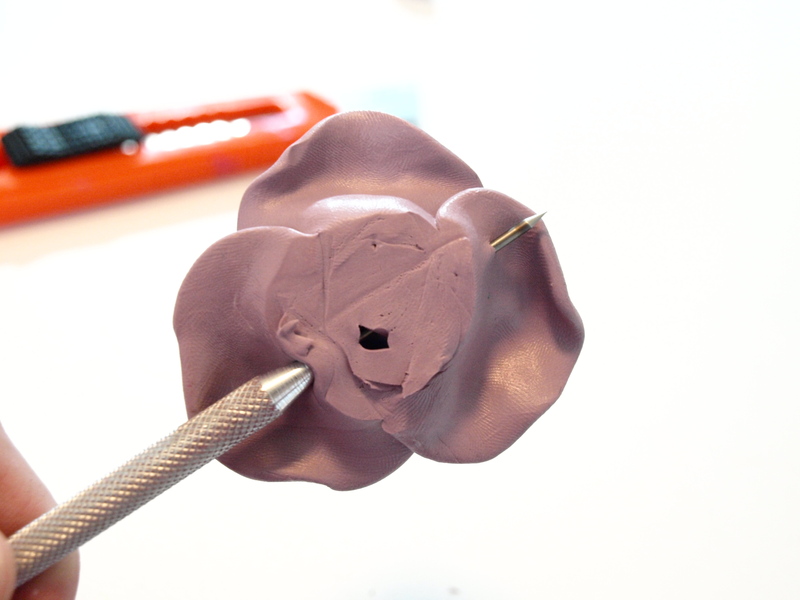 Now continue making your petal disks and wrapping them around the center being sure to somewhat overlap them and being careful to make larger petals as the rose grows outward. Don’t worry about the excess clay that is underneath. I use it to hold on to as I work and then cut it off with a utility knife before I bake it. 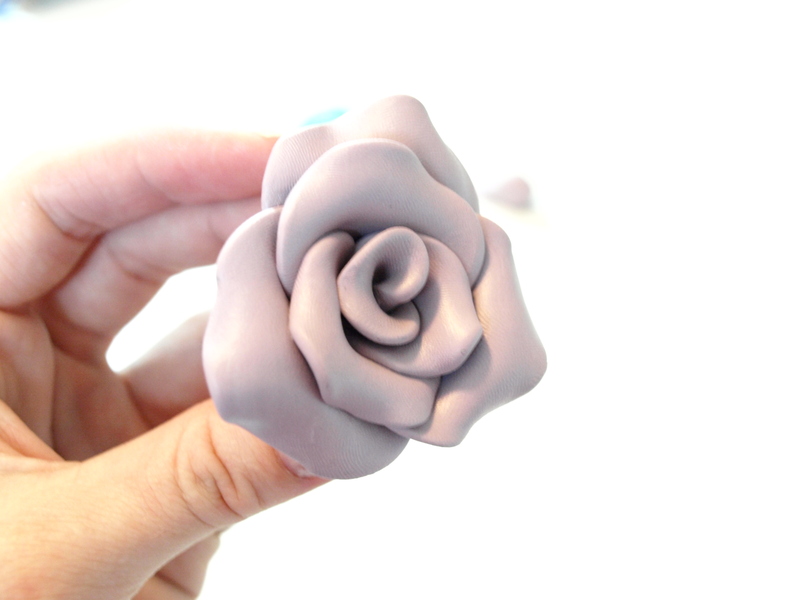 Continue working your clay petals around the rose until it is the desired size and fullness that you like. What do you think? Aren’t you amazed at how easy that was! 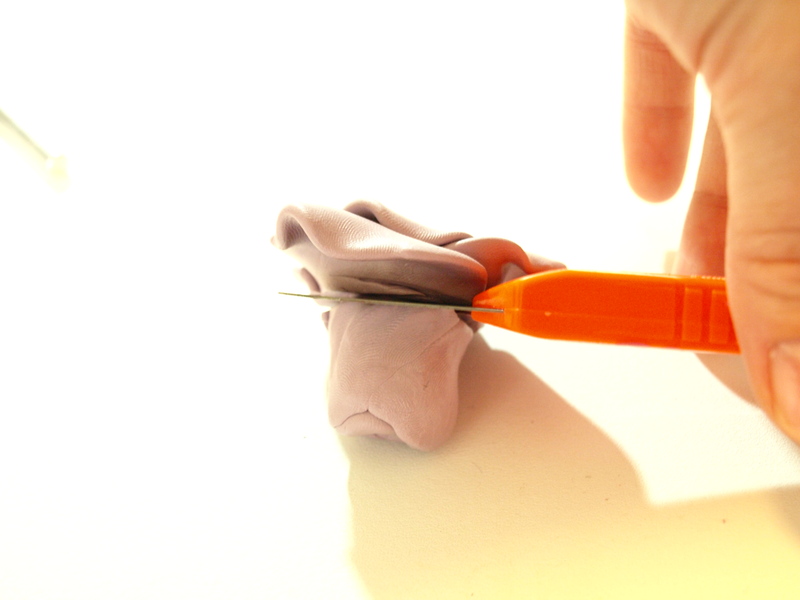 Now take out your utility knife or craft knife and gently carve off the clay “stem” that you’re holding on to. I try to make my roses pretty flat in the back so that they aren’t too bulky on the necklace and have less of a tendency to flip around while wearing it. Try not to handle the rose too much on top since you want to maintain the look of your petals and not accidentally squish your pretty flower too much. Next, take your bead reamer or your skewer (toothpick or needle works too), and create a hole through the base of your rose from one end to the next to allow it to be strung onto an eye pin later. Lay your little rose bud beads out on a glass cooking dish and heat your home oven to 275 degrees (or whatever the clay package suggests). 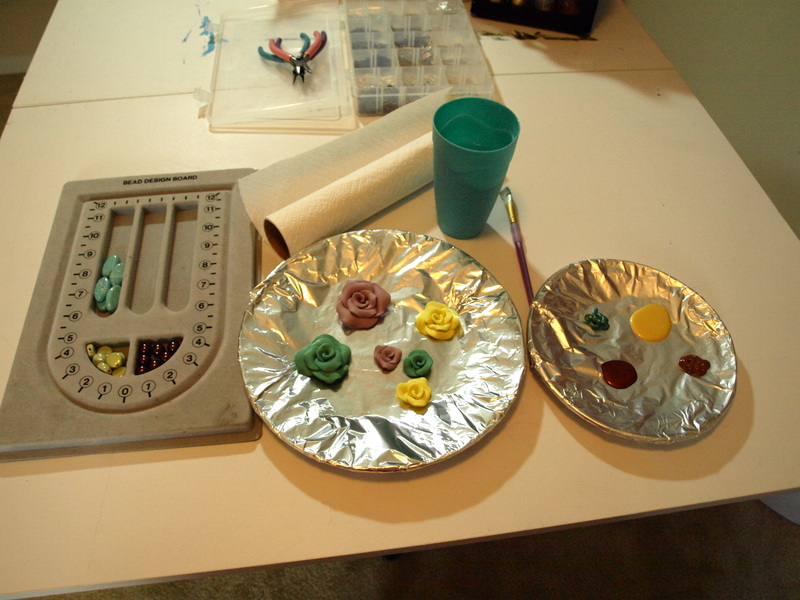 Bake your clay roses according to the time suggested on the clay packaging. 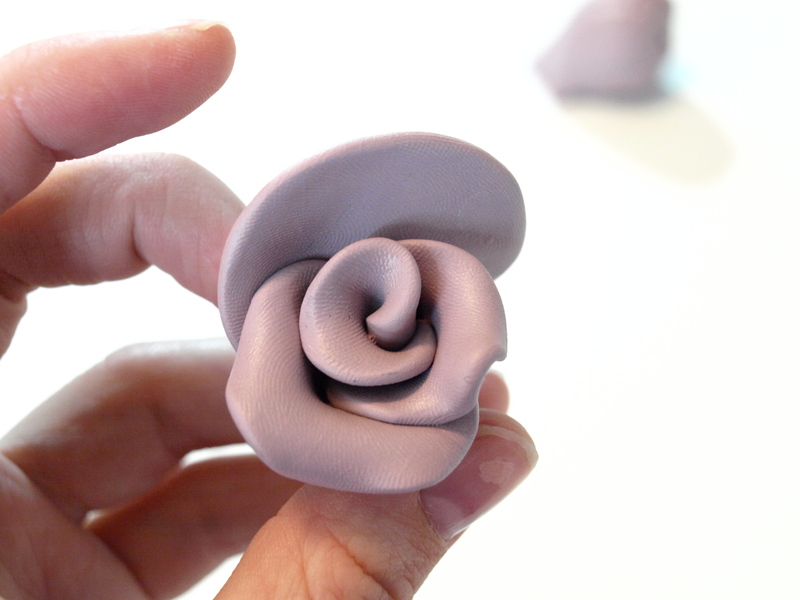 I use Sculpey clay and usually bake around 6-12 roses at once at 275 degrees for about 12 minutes. 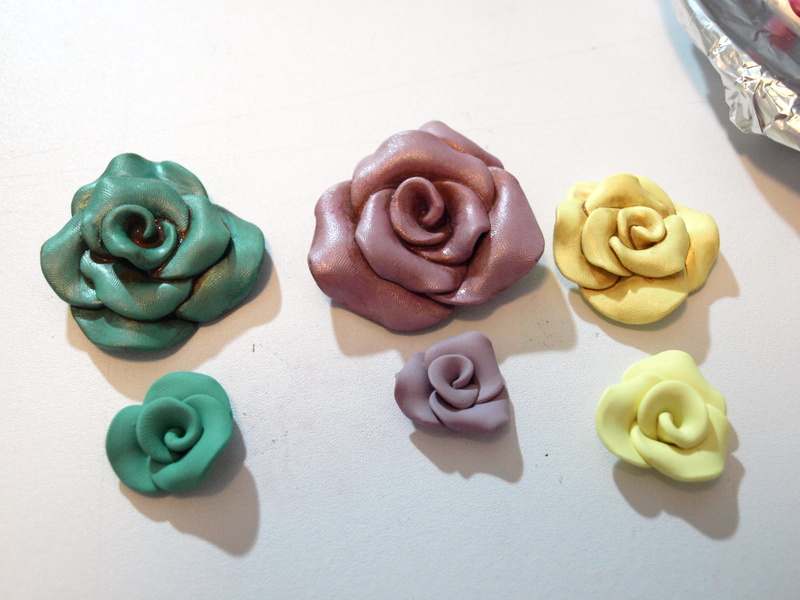 The package says 15 minutes for 1/4 inch clay but I like to somewhat “under-cook” my clay roses so that they are a tiny bit rubbery and not too brittle when they’re cool. I just have found that it makes them a little bit more durable and lets face it, you are not going to want your new work of art to fall apart on your neck later! 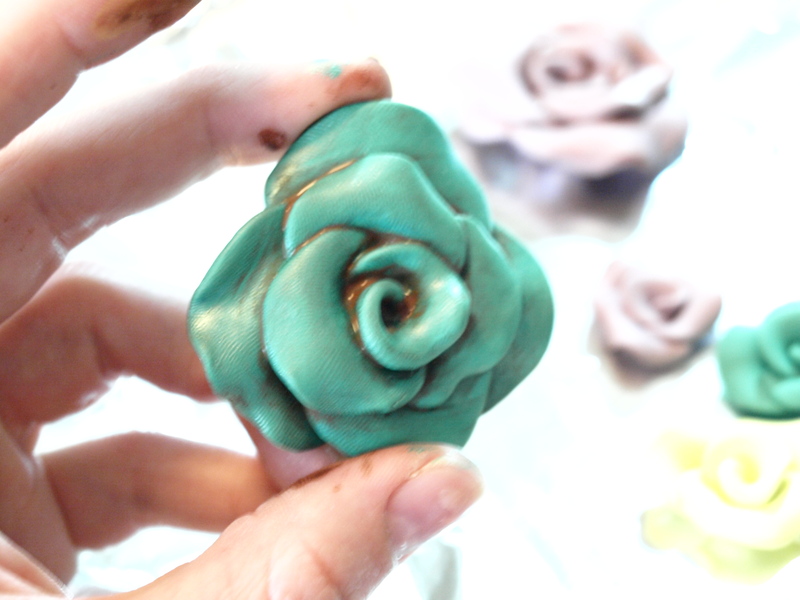 Let your clay roses cool completely. You can see I made some smaller roses to use as rings later if I feel like it. At this point you can use your rose as a bead and wire it to a necklace, you can coat it with a glossy finishing spray, or you can continue on to find out how to antique it a bit (which is what I prefer. I think it just gives it a little something extra and makes it more unique). Prepare your antiquing supplies. Heres how I set mine up: You can see I have my coordinating beads picked out (this helps me decide what colors, and how much, “antiquing” I want to do), my water glass to dilute my paint and rinse my brush in, my painting palette with squirts of my “antiquing” colors on it, another foil wrapped plate to set my wet roses on to dry, and my paper towels to wipe off the excess paint. For these three colors of roses I chose to use a goldy-brown metallic craft paint and a darker brown flat craft paint to give my roses the vintage look I wanted. To do this, wet your brush and generously dilute your metallic color and simply wash it over the entire rose, being sure to get it into every nook and cranny, and then while the paint is still wet, use your paper towel to rub off the excess. This will just ever so slightly tinge the petals a shimmery gold with a heavier application in the crevices. Once that first coat of paint has dried somewhat, do the same technique using the darker brown. 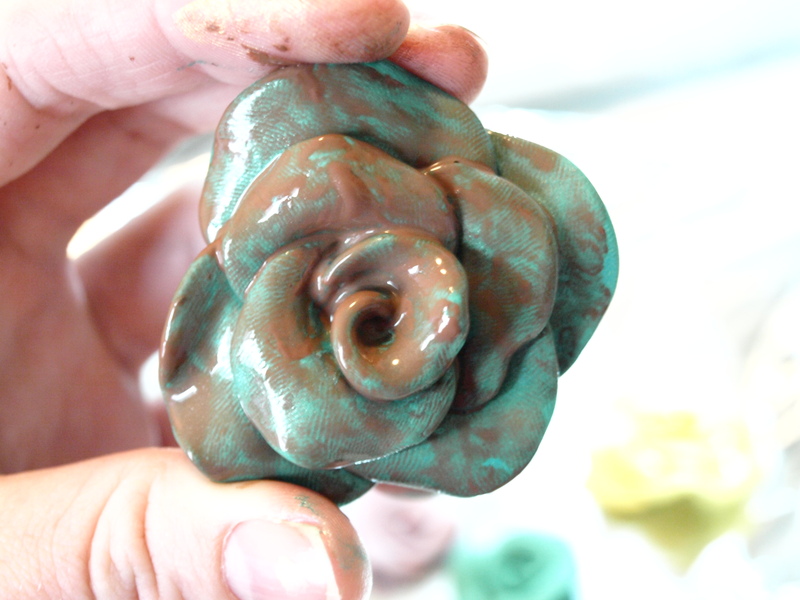 This will allow the paint to seep into the crevices of the petals and give the flower dimension and depth as well as slightly stain the rose an antique-brown tone. You can do this multiple times if you’d like, applying your diluted brown paint with the paint brush to the entire rose and then wiping off the excess to allow the original color to come through and leaving a brown paint deposit in the crevices. Heres a look at what I did with the brown and the gold paint: After it was covered in the diluted paint I wiped off the excess to get this result: Not a HUGE difference but it actually adds a lot of character to the once flat looking rose. Basically what you want to do is pick out an odd number of coordinating beads (an odd number so that a middle bead falls in the middle of the necklace instead of a space), and link them together using eye pins and the wire looping technique you now know. This will be the center of your necklace. The rose will be asymmetrical when alls said and done. Then, using an eye pin and the same looping technique, slide the eye pin through the roses beading hole you gave it and attach it to one end of your beaded chain. 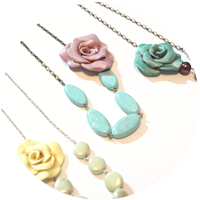 For this necklace I used large brown pearls and antiqued brass eye pins and chain to play off the turquoise antiqued rose. Finally, finish off your necklace by measuring out your chain, attaching the clasp to the center to get the thing on and off, and attaching the chain to your beaded chain and rose. TIP: I think this necklace looks the most flattering when the rose sits right along or right under your collar-bone, so adjust the length of your chain accordingly. There you go folks!! Are you amazed by the beautiful thing you’ve just created?! Believe me, you won’t be the only one! Be sure to make extras since I guarantee there will be some jealous friends wanting a look-a-like asap! I hope you enjoyed this tutorial and had fun making this awesome necklace! Play around a bit and create some more wonderful pieces…maybe earrings or a ring to match? And definitely take the time to learn those basics. I use those simple techniques a lot when I make jewelry and they’re sure to show up in later tutorials!